Kayla's Place: Review & Guest Post: Sun Damage (Sunshine #3) by Nikki Rae! 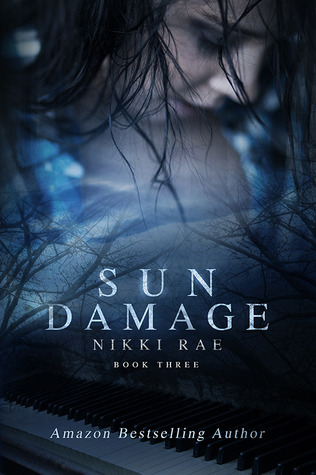 Review & Guest Post: Sun Damage (Sunshine #3) by Nikki Rae! Life wasn't what Sophie was expecting, so why should death be any different? She’s come back from swimming between the two, and every problem she left is still there. And then some. There’s the human world, where she has a brother on the verge of ruins, band mates all set to go on tour, and people she thought she wouldn't be seeing for a long time showing up. Then there’s her new world, where she’s seeing and hearing things that should not be heard or seen. Where Myles knows more about her than she could have ever guessed. She still doesn't know exactly why Michael is tormenting her, but somehow, everything is connected. The monsters are closing in on all sides and the question is, will Sophie be able to defeat them before it all ends? One question people ask me most often is something like, “Whoa, you write books AND you’re in school? Why? How do you even do that?” People think I have these magical powers, or that my talent comes so easily that I don’t even have to think about it, but I don’t really think I’m all that special. Writing for me has always been a hobby and something I’ve loved and needed to do. I would write even if no one wanted to read what I wrote, but I think for a lot of writers, you don’t feel like you’re doing much besides sitting around with a notebook or laptop unless someone is reading your work. Like a lot of Indie authors, I tried to go the traditional route with my book, and when that didn’t work, I found that independently publishing my books was the best option and the best way to have the maximum amount of people read them in the most immediate way possible. I guess I could have waited until I was done with school to do all of this. I know a lot of students who don’t have all of this “extra” stuff going on who struggle with juggling their classes and getting assignments in on time. I honestly don’t have a huge reason why I wanted to self publish now except for the fact that I knew if I waited, I probably wouldn’t have done it. I also was just tired of people asking me what I was writing and having no easy way of reading it for themselves. Self Publishing seemed like a logical solution. That isn’t to say it’s easy. I spend most of my free time working on books, editing, and promoting. However, I like all of these things. I like talking to readers and bloggers and other writers. I’ve met people and made friends that I wouldn’t have otherwise made if I hadn’t done this. There are so many rewarding aspects of this part of my life that it keeps me doing it, despite going to school and working and trying to split my time between everything. I honestly couldn’t ask for more. Ahhh... sigh... another Sophie & Myles epic story. Love, love, love these characters & this story. We were left with a huge cliffhanger at the end of the last novel so I couldn't wait to get my hands on this one! Loved it. Sophie's life definitely took an even more difficult path... I can hear you saying now, "Wait? How is that possible? Girl couldn't even go in the sun before? How can it get much worse?" Ha. Well, yea. I thought that too. But this story's ending definitely wasn't a cake walk. She ended up having to deal with an even great issue at hand, life changing and all, plus she had to try to find a way to calm her inner battles when it came to Myles. Decisions, decision. This story, more so than the others, definitely has a more.... half glass empty... type feel too it. Everything just seems so dreary for the longest time because Sophie is constantly raging an inner battle about her life. Plus, she's disconnected from her bandmates/friends. And she's definitely disconnected with Myles. When things begin to finally reconcile, the book took on a much more lighter tone and was soooooo easy to read. I kept flipping pages and eating up the words. The plot has several different climaxes, one in particular where they were trying to get away from a certain someone...and a certain someone surprised us all and helped by... Well, crap. No spoilers! :) I was definitely surprised by a few character revelations! Completely changed the way I looked at a certain someone. Overall, I loved this finale for the Sunshine Series. I have to admit, I'm a little on the fence about the epilogue because I'm just not quite sure how I feel about it. I didn't NOT like it. I just simply said, "Hm. Alright. Well, that's that then." So, great ending to a trilogy & I'll truly miss reading about these characters! I'm sad to see it end but happy that I was able to take the journey with Sophie!! Definitely recommend this series to anyone looking for a vampire novel that's definitely different than the average vamp tale. Cover Rating: 5 Huge Stars <-- This series has the most amazing covers! Loveeeee them!